There are myriad reasons why benchmarking is so vulnerable to leaving truth behind. First, it’s deceptively hard to quantify the performance of a system simply because the results are so difficult to verify: the numbers we get must be validated (or rejected) according to the degree that they comport with our expectations. As a result, if our expectations are incorrect, the results can be wildly wrong. To see this vividly, please watch (or rewatch!) Brendan Gregg’s excellent (and hilarious) lightning talk on benchmarking gone wrong. Brendan recounts his experience dealing with a particularly flawed approach, and it’s a talk that I always show anyone who is endeavoring to benchmark the system: it shows how easy it is to get it totally wrong — and how important it is to rigorously validate results. Second, even if one gets an entirely correct result, it’s really only correct within the context of the system. As we succumb to the temptation of applying a result more universally than this context merits — as the asterisks and the qualifiers on a performance number are quietly amputated — a staid truth is transmogrified into a flying falsehood. Worse, some of that context may have been implicit in that the wrong thing may have been benchmarked: in trying to benchmark one aspect of the system, one may inadvertently merely quantify an otherwise hidden bottleneck. 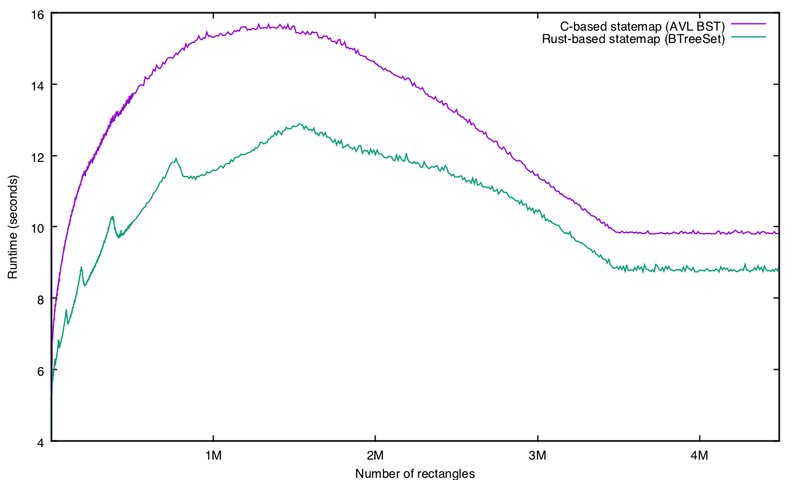 So take all of this as disclaimer: I am not trying to draw large conclusions about “C vs. Rust” here. To the contrary, I think that it is a reasonable assumption that, for any task, a lower-level language can always be made to outperform a higher-level one. But with that said, a pesky fact remains: I reimplemented a body of C software in Rust, and it performed better for the same task; what’s going on? And is there anything broader we can say about these results? So the Rust version is issuing a remarkably similar number of instructions (within less than one percent! ), but with a decidedly different mix: just three quarters of the loads of the C version and (interestingly) many more stores. The cycles per instruction (CPI) drops from 0.65 to 0.47, indicating much better memory behavior — and indeed the L1 misses, L2 misses and L3 misses are all way down. The L1 hits as an absolute number are actually quite high relative to the loads, giving Rust a 96.9% L1 hit rate versus the C version’s 77.9% hit rate. 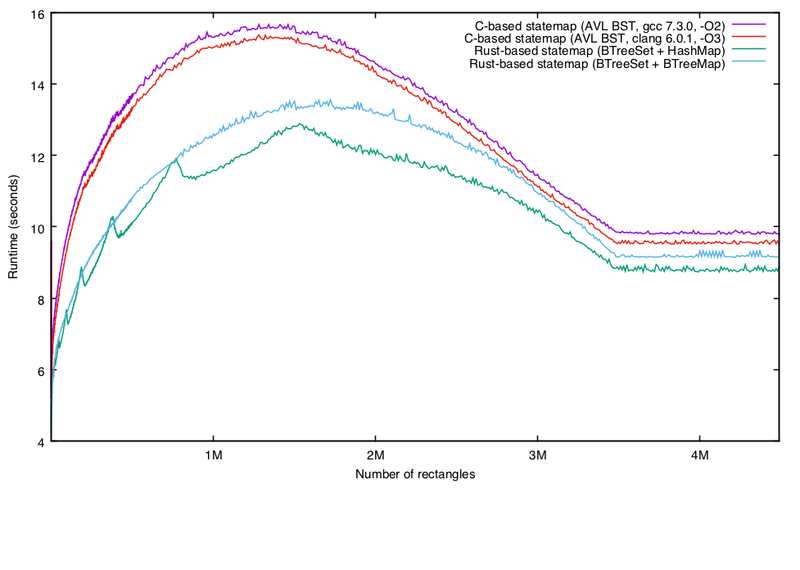 Rust also lives much better in the L2, where it has half the L2 misses of the C version. Could the performance difference that we’re seeing simply be Rust’s data structure being — per its design goals — more cache efficient? To explore this a little, I varied the value of the number of rectangles in the statemap, as this will affect both the size of the tree (more rectangles will be a larger tree, leading to a bigger working set) and the number of deletions (more rectangles will result in fewer deletions, leading to less compute time). A couple of things to note here: first, there are 3.5M state transitions in the input data; as soon as the number of rectangles exceeds the number of states, there is no reason for any coalescing, and some operations (namely, deleting from the tree of rectangles) go away entirely. So that explains the flatline at roughly 3.5M rectangles. Also not surprisingly, the worst performance for both approaches occurs when the number of rectangles is set at more or less half the number of state transitions: the tree is huge (and therefore has relatively poorer cache performance for either approach) and each new state requires a deletion (so the computational cost is also high). Just from eyeballing it, they seem to appear at roughly logarithmic frequency with respect to the number of rectangles. My first thought was perhaps some strange interference relationship with respect to the B-tree and the cache size or stride, but this is definitely a domain where an ounce of data is worth much more than a pound of hypotheses! The samples in btree::search::search_tree are roughly the same — but the poorly performing one has many more samples in HashMap<K, V, S>::insert (4123 vs. 2948). What is going on? The HashMap implementation in Rust uses Robin Hood hashing and linear probing — which means that hash maps must be resized when they hit a certain load factor. (By default, the hash map load factor is 90.9%.) And note that I am using hash maps to effectively implement a doubly linked list: I will have a number of hash maps that — between them — will contain the specified number of rectangles. Given that we only see this at particular sizes (and given that the distance between peaks increases exponentially with respect to the number of rectangles), it seems entirely plausible that at some numbers of rectangles, the hash maps will grow large enough to induce quite a bit more probing, but not quite large enough to be resized. To explore this hypothesis, it would be great to vary the hash map load factor, but unfortunately the load factor isn’t currently dynamic. Even then, we could explore this by using with_capacity to preallocate our hash maps, but the statemap code doesn’t necessarily know how much to preallocate because the rectangles themselves are spread across many hash maps. Another option is to replace our use of HashMap with a different data structure — and in particular, we can use a BTreeMap in its place. 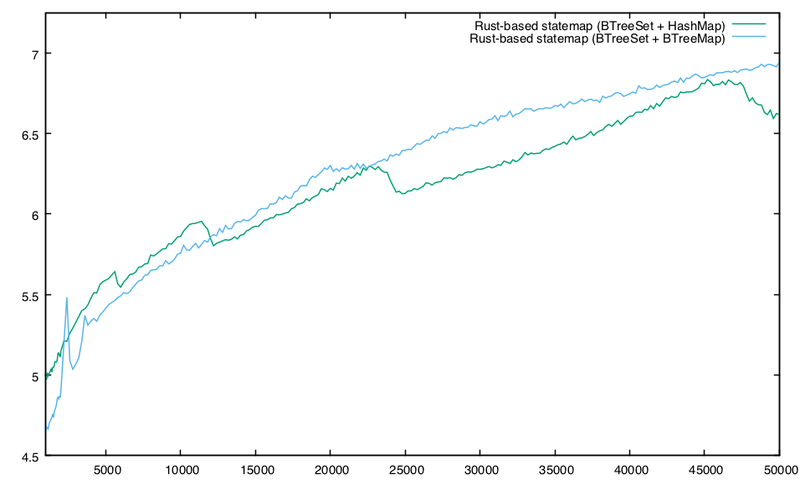 If the load factor isn’t the issue (that is, if there is something else going on for which the additional compute time in HashMap<K, V, S>::insert is merely symptomatic), we would expect a BTreeMap-based implementation to have a similar issue at the same points. I don’t know what happens to the BTreeMap-based implementation at about ~2,350 rectangles (where it degrades by nearly 10% but then recovers when the number of rectangles hits ~2,700 or so), but at this point, the effects are only academic for my purposes: for statemaps, the default number of rectangles is 25,000. That said, I’m sure that digging there would yield interesting discoveries! So, where does all of this leave us? 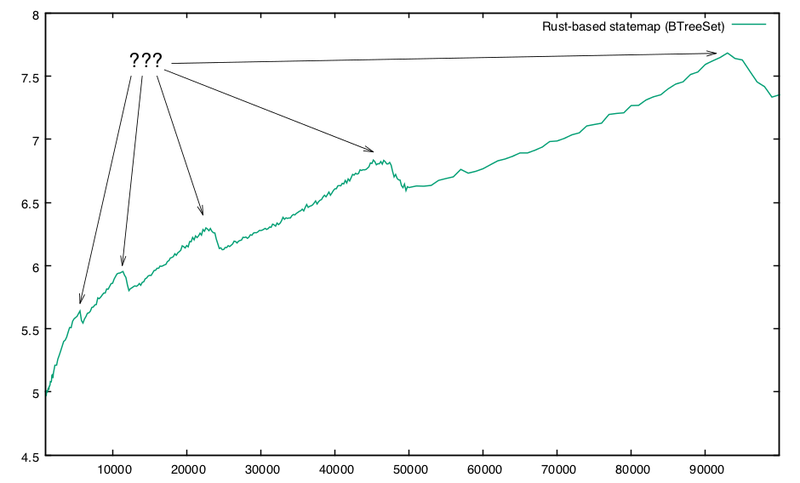 Certainly, Rust’s foundational data structures perform very well. Indeed, it might be tempting to conclude that, because a significant fraction of the delta here is the difference in data structures (i.e., BST vs. B-tree), the difference in language (i.e., C vs. Rust) doesn’t matter at all. Contrast this to Rust: intrusive data structures are possible in Rust, but they are essentially an anti-pattern. Rust really, really wants you to have complete orthogonality of purpose in your software. This leads you to having multiple disjoint data structures with very clear trees of ownership — where before you might have had a single more complicated data structure with graphs of multiple ownership. This clear separation of concerns in turn allows for these implementations to be both broadly used and carefully optimized. For an in-depth example of the artful implementation that Rust allows, see Alexis Beingessner’s excellent blog entry on the BTreeMap implementation. All of this adds up to the existential win of Rust: powerful abstractions without sacrificing performance. Does this mean that Rust will always outperform C? No, of course not. But it does mean that you shouldn’t be surprised when it does — and that if you care about performance and you are implementing new software, it is probably past time to give Rust a very serious look! Despite its improvement over GCC, I don’t think that the Clang results invalidate any of my analysis — but apologies again for not including them in the original post! How do you run Rust on SmartOS? I’ve been meaning to try it but the lack of Illumos support was holding me back. Rust seems to have been available for SmartOS in pkgsrc since at 2015Q4. 2018Q2 has Rust 1.27 (and trunk 1.29). Maybe try clang as the C compiler? See my update at the end of the blog entry. Short answer: yes, I did — and yes it made a difference, but no, it wasn’t really material. Thanks for this very interesting story where instead of comparing languages you ended up comparing data structures performances. AFAIK there is also another factor that can also influence relative performance of languages but which is not strictly part of the language: did you consider the link-time optimization for the C implementation ? The cargo build system might always enable it for `–release` which will trigger more optimization part. As far as I know, ltos are disable by default on every rust build profile. > it shows how easy it is to get it totally wrong — and how important it is to rigorously validate results. 2. and then proceed to measure different kinds of data structures, albeit the analysis is indeed well detailed. Surely you may want to fix 2 factors to measure the third. It just seems like you didn’t getting the point… Bryan clearly stated that it’s not a 100% apples-to-apples comparison and that it would be possible to implement an equivalent data structure in C which would “fix the other two variables” as you put it. But how much time/effort would that take? As he said, debugging that would be a pain and it would also make the caller need to take some special considerations. Note that you can think of performance in the broader perspective of how long it takes you arrive at that stable/correct and *very highly* CPU-performant solution. Thanks a lot (Bryan) for that detailed and well-written review!! > But how much time/effort would that take? How is that an excuse for the poor benchmark? The post leaves it very clear that what is being compared here is the holistic development environment provided by each language (data structures, design decisions, etc. with an additional consideration of how long it took to get to the executable state), and NOT ONLY the compiler optimization pipeline. We have here a great comparison of how the same task is done in two different ways by an extremely competent programmer… I would appreciate it more if I were you! Rust vs C is not really a fair comparison. *Of course* good Rust code is faster — it’s a more powerful, expressive language. You can capture powerful, sophisticated processes in libraries, and optimize and debug them there, and then pass them along for everyone to use. You get the benefit of all the powerful libraries that others have poured attention into. Those libraries cannot be coded in C. Anything sophisticated in C has to be coded, debugged, and optimized in place. The natural competition for Rust is C++. C++ programs are routinely faster than a C version would be, for the reasons above. C++ has the handicap of backward compatibility with C, with bad defaults, making it harder to optimize, and more work to avoid hard-to-optimize constructs. But it has the advantage of better compiler maturity, more people writing and optimizing libraries, and more effort to make processors that run it fast. It has multiple implementations that compete to do it better. It is also, still, more expressive, more able to capture semantics in libraries. 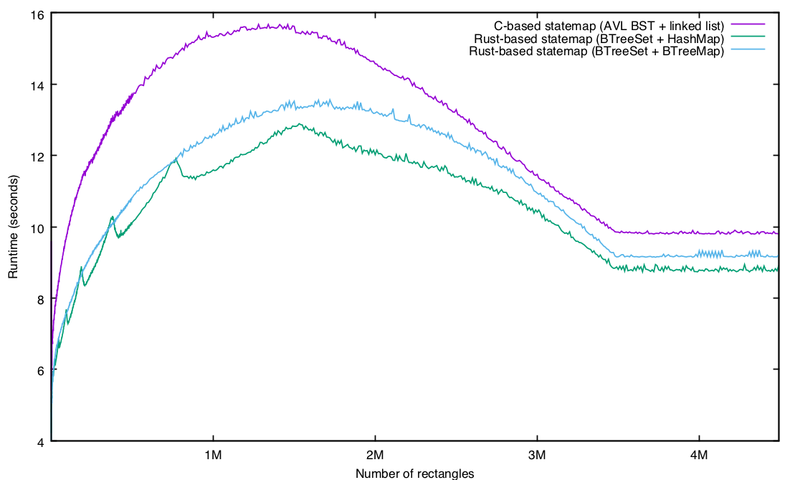 Rust may be catching up as it adds and stabilizes features, but C++ is a moving target. By the way, I did some googling, and I’m pretty sure you can implement a proper doubly-linked list with Rust’s RefCells. No clue if the performance is better, though. Glad to hear you’re enjoying Rust. You and I overlapped briefly in undergrad — Adam and I TAd together a bunch. 3 years or so ago my group started working on a new embedded OS; we decided to write it in Rust (www.tockos.org). It’s been a great experience. We struggled with a few aspects of how the language (and lifetimes in particular) are quite tied to a thread-based execution model, but mostly figured it out. I personally think systems research is entering a very exciting new time: so much of our work has been defined and constrained by C, and how we have two compelling alternatives for different domains, Rust and Go, so now we have a trio of options.